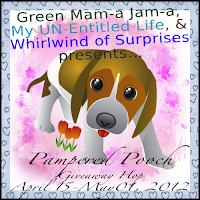 Welcome to the Pampered Pooch Giveaway Hop hosted by Green Mam-a Jam-a, My UN-Entitled Life, & Whirlwind of Surprises. Join us and enter the win some pet swag on the blogs featured on the linky below for all your pet needs. This one's for all the furry critters in our lives. And, get bonus entries for hitting every blog on the list! All you have to do is enter the giveaway or if the giveaway is not open to where you're from, leave a comment so that we know you visited. Here at WOS, you'll find lots of prizes with a total value of $490. What are you waiting for? Enter now! Sponsor 1: Sleepypod offers versatile carriers for your pets. Learn more about them here. Buy It: Shop online at Sleepypod for your pet carriers and more. The Sleepypod Air sells for $159.99. Sponsor 2: Check out Mr.Chewy for your pet supplies. See my review. Buy It: Shop online at Mr.Chewy for your pet needs. Use WHIRL2866 for 10% off your first order AND Mr.Chewy will make a $10 donation to an animal charity! Note: I do not receive anything from this code. I'm just happy that animal charities will be helped. Sponsor 3: Worried about lost pets? Learn more about FurCode here Buy It: Shop online for your own FurCode. They retail for $19.99, now on sale for $14.99. Free shipping and handling WORLDWIDE. Sponsor 4: Does your pet walk you? Instant Trainer Leash may have a solution for you. Learn more about them here. Buy It: Shop online for your own Trainer Leash. They recently dropped their price from $19.99 to $9.99 + $8S&H. They are no offering a similar deal to before where you can pay the additional $8 shipping making a total of ~$26 for an additional 2 Reusable Sticky Rollers and a 2nd Instant Trainer™ in the same size. Sponsor 5: Soggy Doggy products are the thing to get to keep your babies dry and the mess at the door! Learn more about them here. Buy It: Shop online for your own Soggy Doggy products. Soggy Doggy Doormats retails for $39.99 (small) or $84.99(large) and the Soggy Doggy Shammy retails for $19.99. Use WHIRLDOG15 for 15% off your purchase! Runner Up Prizes -8 x $20 (WORLDWIDE): 8 lucky WOS readers will win 1 Fur Code ($20) for themselves. Want more? Check out the other giveaways in this hop!Disclaimer: The product/s mentioned above have been provided for the purposes of this review. No other form of compensation was received. Opinions expressed belong to Whirlwind of Surprises and are NOT influenced in any way. Please view my full disclosure. WOS is not responsible for sponsors who do not fulfill their prizes. Instant Trainer Leash-I like that it uses gentle but firm resistance to discourage your dog from pulling. Sleepypod- I love the Yummy Travel Bowl in Sea Breeze! Mr.Chewy- I love the Thrill cat treats! Fur Code- I learned that experts estimate that nearly 60 percent of traditional tags contain outdated owner contact information. Soggy Doggy- I like the doggy doormat in blue withe the brown bone! I would love to have the Sleepypod. I have a kitty that would love this. Her name is Samantha and she is deaf. She loves to curl up in small spaces so this would be perfect for her. We also love Mr. Chewy. I adopted a puppy just before Christmas and Mr. Chewy comes in quite handy. The Fur Code would be awesome for our puppy because she has a tendancy to run out the door when the door is opened. She is microchipped but this would help. The trainer leash would alos be good for the puppy because yes, she does walk me. She is just learning. And again Soggy Doggy would be awesome for the puppy. She is forever bringing her wet paws in the house. This is an awesome list of prizes you have! Thanks for the giveaway! Of course I had to check out the secret first. Each of the “noodles” in the Soggy Doggy Doormat® and Soggy Doggy Super Shammy is made from millions of textured, ultrafine strands woven together, so the surface area of these products is much greater than meets the eye! Buy 1 leash trainer and get a second one for just the additional shipping cost. FurCodes are Laser-Etched Aluminum, making them lightweight, waterproof and nearly indestructible. Anyone equipped with a Smartphone or Internet access can quickly check your pet’s Fur Code tag and find out where they belong, without visiting a shelter. Mr. chewy has over 80 popular brands of food and treats. Sleepypod hired JARI to test the crash safety of their products. Sleepypod, like the blue one that encloses for cats, Mr. Chewy carries every type of cat food they use...great selection, Furcode, we use Pethub but can use extra ID for extra collars. Trainer leash, I'm training my cats on a leash for emergencies - don't ask how is it going! Soggy Doggy, Bright Blue one for the Cats master bath. The review posts miss skim over info about all the companies, I didn't think you were trying to be analytical or comprehensive. Sleepy pod!! They would love it! Leash with no more pulling yeah! I liked the beige one! @hazelflagg, This is the giveaway post. By each sponsor, there is a link to the review post which has extensive reviews of the products I received. Instant trainer would help me with my Boxer in the way of control. Fur Code is really nice. My aunt has them for her dogs and loves them. Sleepy Pod pet carrier is really neat, it can be used for many things. Mr. Chewy has everythin you use and at reasonable prices. Soggy Doggy looks fantastic!! They are nice looking, colors will blend in with most color schemes, and very useable on keeping down the mess. Sleepypod- love the crater dot! Mr.Chewy- Love their referral program for shelter animals. Fur Code- I love that when your info changes you don't need a new tag, just go online and update the info! Instant Trainer Leash- they have a 30 day money back guarantee!! Soggy Doggy- absorbs 5x more water than a normal doormat. Sleepypod - I want everything! Other then the carriers, I would love to have a bunch of Crater Dots (with heaters). Fur Code - As "Mom" to several special needs pets, I really like that you are able to record your pet's medical and dietary needs on the profile. Instant Trainer - I like that it's gentle and won't harm the dog's neck. Soggy Doggy - I'd love to have the super shammy in blue. Fur Code - Love the fact that it has the QRC b/c most people have smart phones these days! Instant Trainer - I only have cats but love that it fits any color - I have lots of friends with dogs who would love this! Mr.Chewy-I like the Pet Naturals of Vermont Agility DMG Chews. Furcode-I like that they have the qrc, i would feel very safe knowing that. Instant Trainer Leash- I really need this, my 50 lb puppy pulls me on our walks and its really hard for me to talk her for a walk. At Sleepypod - I like the Mango Tango Yummy Bowls. At Mr. Chewy - I'd like to get the Science Diet Adult Small Bites Dry Dog Food. At FurCode-I like that the tags come in a choice of five colors. Instant Trainer - I like that The Instant Trainer teaches your dog to be a great walker. At Soggy Dog - I like the Soggy Doggy Super Shammy. My dog hates being wet. I would love to dog bed from Green Mama Jama's site! My UnEntitled Life Blog and she said to claim the points and let you know that some aren't up. Sleepypod - A carrier for my kitty. Instant Trainer Leash - That looks pretty cool! I've never seen something designed like that before, but I can see how it works. From the doggy mom - I did vote both times but never did get a vote number. Sleepy Pod has a great Crater Dot that I would love! FurCode appears to have one really great product and my guy wants one! The Instant Trainer leash will need to be in red! The Soggy Doggy Door mat I would love is the 36X60 in Dark Chocolate/Oatmeal. Mr.Chewy- I love that the potty pads can be set-up for scheduled deliveries. Since my Yorkie is potty pad trained this would be great. Fur Code- I like that the FurCode tags are priced for anyone to afford and doesn't hurt your pet by implanting something under their skin. Instant Trainer Leash- I like that the leash helps prevent your dog from pulling. Since I walk with a cane this is great for me and my Bentley. Soggy Doggy- I love this product. Since my Yorkie, Bentley, has hairy feet this is great for those wet days. I live in a apartment so keeping the carpets clean are very important. With the help of this doormat it makes it much easier. Sleepypod: love that it folds up. With 4 cats...that would really save space. Mr. Chewy: I learned that I could order my Frontline Plus meds (for all 4 cats) cheaper here than at our vet. Fur Code: Sad that only 1 in 5 missing pets are ever found. Also sad that pets that do not have this and are brought to a humane society, they have to be put down. Sleepypod ~ they got A LOT of Awards for their products -wow ! Fur code ~ love their ' real people'reviews and learned that they are lghtweight, waterproof and nearly indestructible. My ginormous pup is entirely too big for a sleepypod but I do love those yummy bowls!! I absolutely need to get a soggy dogggy doormat. Omg how have I survived w/o one this far?!? And my favorite is the dog code id tags!!! I love love love it! I want to get one immediately for my guy & every other fur baby I know of. Thank you so much!!! The Crater Dot is a comfortable lounge and my sons cat would love it. Natural Balance L.I.D. Limited Ingredient Diets I'd like to try the Sweet Potato & Venison Dry Dog Food for my picky eater dog. I like the fact that Fur Codes are Laser-Etched Aluminum, making them lightweight, waterproof and nearly indestructible. My son's boxer could sure use the instant leash to discourage pulling. The rainy weather where I live makes a product like the Soggy Doggy very useful. The Rafflecopter isn't showing, but we would love to enter your contest. Rafflecopter is very slow today. Give it some time to load and if not, refresh the page. I've been having some troubles myself on other sites with their rafflecopter forms. Best I can suggest is to try again. We'd love for you to enter too. Thanks! Sleepypod has some great travel bowls. Mr Chewy carries the Friskies my cat likes. The microfiber chenille blend allows the Soggy Doggy Doormats® and Super Shammys to soak up water and dirt like a sponge! *Fur Code - ID tags use QR technology for scanning with cell phone. *Instant Trainer Leash - discourages your dog from pulling. *Soggy Doggy - Mats absorb water and dirt. LOVE all these sites & products! I would love to get A Crater Dot Lounger from Sleepypod, some Royal Canin Dog food from Mr Chewy, A regular size fur code tag in Blue from Fur Code, A small instant trainer leash (these look AMAZING & both of my mini schnauzers need these!) and from Soggy Dog- a Soggy Dog doormat in the caramel/oatmeal color with the bone on it! Thanks for the chance! Soggy doggy Doormat - I love the caramel/oatmeal bone doormat and could really use it for my dogs! The Instant trainer- I love that it is vet and trainer approved. Means it will help my pet! Fur Code- I have a very tiny ChiPoo and he loves to get away from me-this would give me piece of mind! 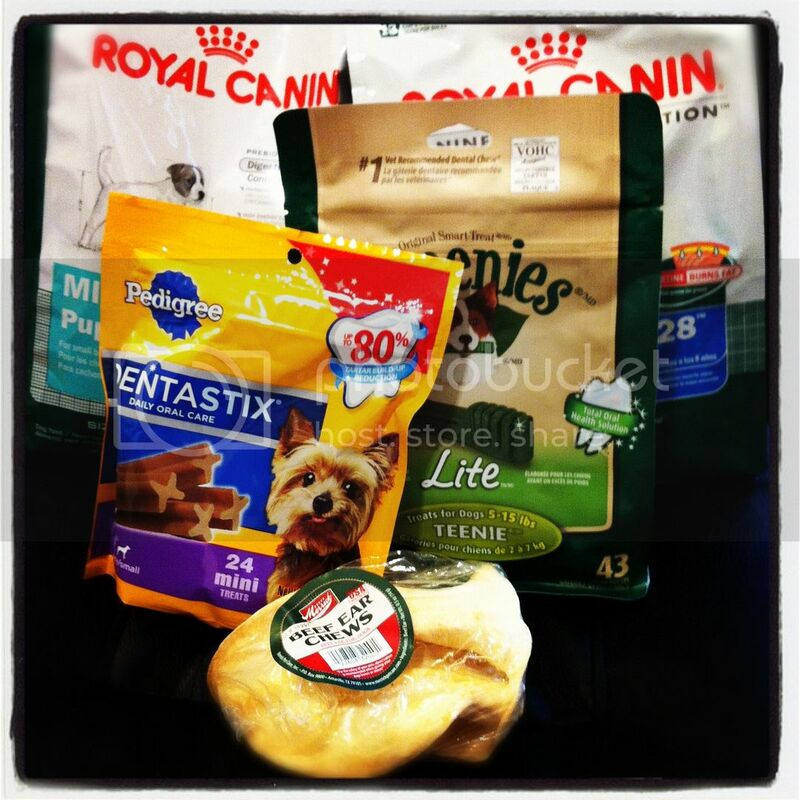 Mr. Chewy-I would love to try the Blue Buffalo products for my dogs! At Sleepypod I checked out the Air Mesh Bedding (which for Southern California would be a must) and read that the mesh material allows air circulation all around a pet and that it is a highly durable polyester mesh that simply zips into a Sleepypod. The Air Mesh suspends a pet above the base to provide cool and relaxing comfort. I visited Mr. Chewey, where I have been many times before. We get cat treats from them. I noticed that if I spend $49 that my shipping would be free. A thing to remember. At Fur Codes I read that FurCodes tags contain vital information about your pet. Similar to traditional pet tags;but are infused with highly sophisticated yet simple to use technology. I'm glad that I checked it out because I thought they were just tags. What a great idea. When reading up on the Instant Trainer Leash I noticed that The Instant Trainer™ Leash uses gentle but firm resistance to discourage your dog from pulling. Then I got to the thing that I really need! Those Soggy Doggy Doormats® look like a great idea and I have wet animals (dogs and cats) tracking in and out of the house all of the time! Close reading revealed that the microfiber chenille blend allows the Soggy Doggy Doormats® and Super Shammys to soak up water and dirt like a sponge! I want this! Plus I think we should get another Soggy Doggy Super Shammy just for the cat. Sleepypod - The Air carrier means you and your pet can travel in comfort! Also "meets major airline carry-on pet regulations by being able to compress in length from 22" to 19" when one side is compressed, or 16" when both sides are compressed." FurCode - I've seen several of these QR code tag companies lately crop up (readable by smartphones with the QR reader app), and FurCode's tags are made of "laser-etched aluminum, making them lightweight, waterproof and nearly indestructible." Instant Trainer - The system "uses gentle but firm resistance to discourage your dog from pulling." It also attaches to any collar, and you can walk multiple dogs with confidence! Sorry forgot Soggy Doggy - it absorbs up to five times more water than regular doormats - excellent! Sleepypod has some really awesome bowls for pets. They look interesting. Fur Code - is a great way to help get your pets back. Mr Chewy is "Just an average dog with big dreams"
Sleepypod: I would LOVE a Sleepypod Plush or Air Mesh for my cat. She would be so cute in it. Mr Chewy: They carry the grain-free brands that my cat eats- Wellness and Natural Balance. Soggy Doggy: absorbs 5x as much water as regular cotton doormats. Instant Trainer Leash: would be good for my friend's dog, who always pulls on her leash when they go for a walk. Fur Code tags have a scannable QR code so you can enter all your contact info for your pet's tag. Really good idea! I love the Sleepypod Air. I would definitely buy one if I needed to travel on a plane with my cat! Sleepypod- I like the Crater dot. Fur Code- I love that the QR codes are easy for anyone with a smartphone to scan. I know if i found a dog with one of those collars i would scan their collar and return them to their owner. Sounds much easier and more likely for a dog to be returned than taking a lost dog to the pound or vet and hoping that they had been microchipped to get them home. Instant trainer leash- I like that it comes in different sizes and seems easy to put on. One thing that i wonder is if it would be safe for my dog. OUr pug can't be leashed on a collar due to an eye injury but if i won, i would give it to one of his doggy friends that could use it. Sogy Doggy- I like the fact that the soggy doggy shammy has hand pockets. Might not seem too impressive but i can totally see it making it easier to use and less messy. I entered all the giveaways except there were several that closed early. Thanks for the giveaways. Sleepypod- my kittehs definitely need the electric warmer. Fur Code- really??? A smartphone can read these?? ?